I recently cut the cord on my cable service (figuratively, of course). Before doing this, though, I purchased NHL Gamecenter so I could watch my hockey and got an indoor antenna so I could watch my football. However, I didn't think about the fact that getting rid of my cable box effectively got rid of the only clock I had in my living room. Surprisingly, this was more annoying than not watching live TV anymore. Losing my living room clock gave me an opportunity to increase that conversion rate to 1.26%. And so I did. 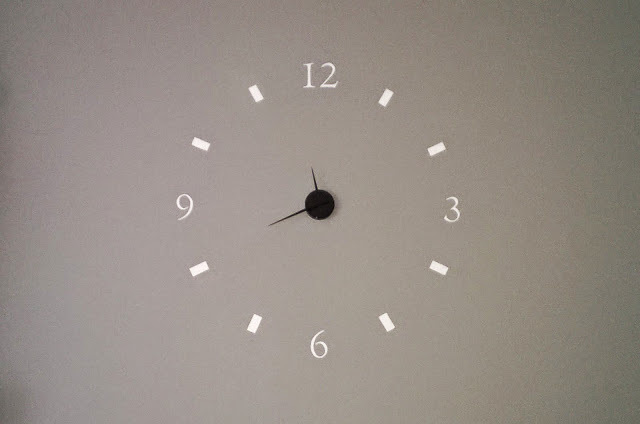 Having first seen a wall clock on the Martha Stewart site, I knew now was the time to channel my inner MS. I still want to find, or make, some cheap clock arms that are larger than the ones I used, but they work for now. The diameter of my clock (from the bottom of the 12 to the top of the 6) is about 29". For some perspective of how large a 29" clock is, here it shown next to my 42" TV. P.S. I'm hoping to add the method I used soon.